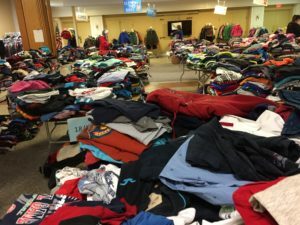 Return to current year’s Kids’ Clothing Event page. 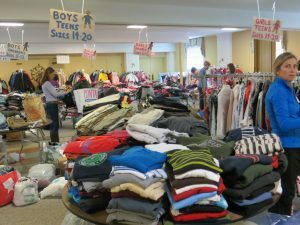 The spring 2018 Kids’ Clothing Event was held Thursday, April 19 from 4-8, and Friday, April 20 from 9-12 at St. Matthew’s United Methodist Church of Valley Forge at 600 Walker Rd. 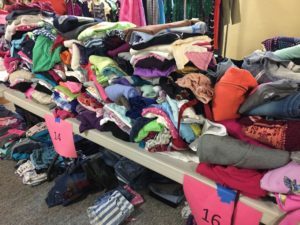 We had a record number of folks come looking for clothes, and we are positive that we were able to offer significant assistance to many of them. Thanks to all those who donated the clothes, sorted the clothes, transported the clothes, and worked at the event itself. 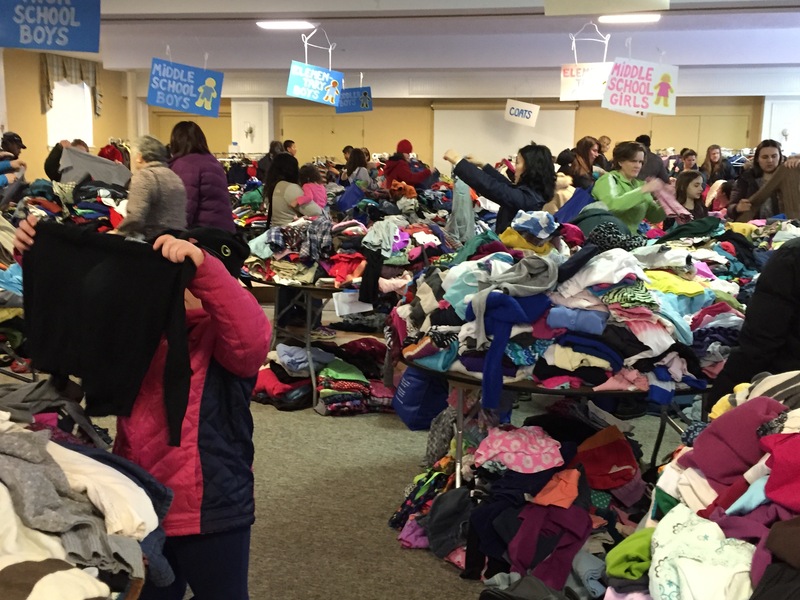 Over 250 volunteers were needed to pull this off – and we thank each and every one of them. 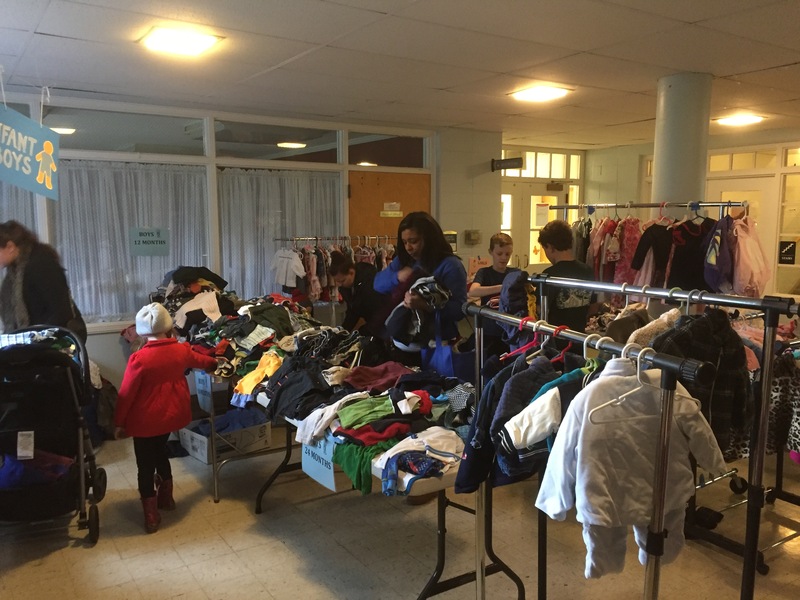 Clothes were collected from April 4-13 at various sites around the community – including all the TESD schools and the Tredyffrin Library and the Easttown Library. We collected clothes for all seasons, from infant through teens. 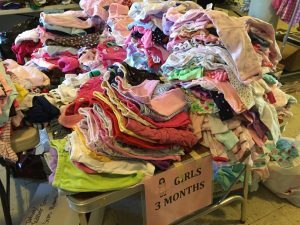 All left over clothes were donated to either the local Maternity Coalition (especially helping low income moms with newborns) or Big Brothers/Big Sisters. Both groups were very thankful for this partnership. Check the thank you list below to see who deserves your appreciation, and the pictures to see what the event was all about. Questions? 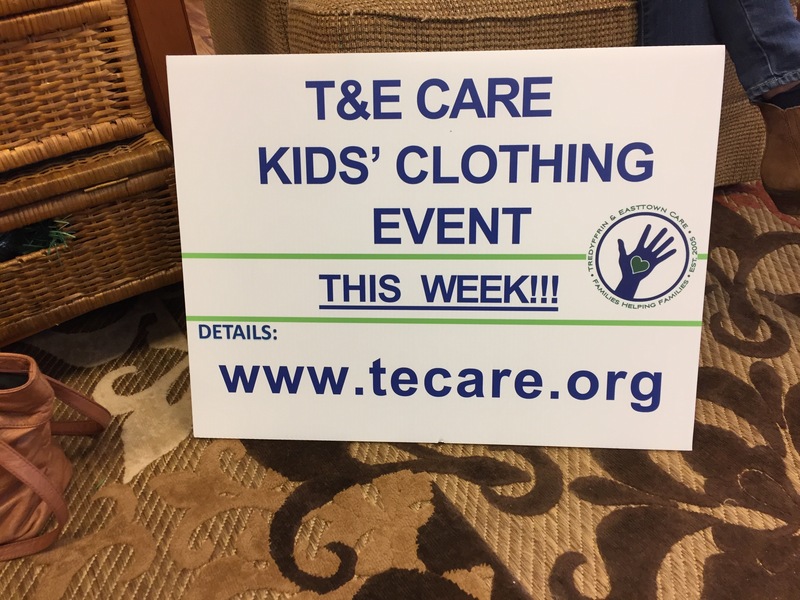 Contact us at clothes@tecare.org. The Profile Image – for printing all the street signs to help us advertise the event. They were a HUGE supporter! Abby Schwartz Associates – for doing all the printing of the posters used to help us advertise the event – another huge supporter! 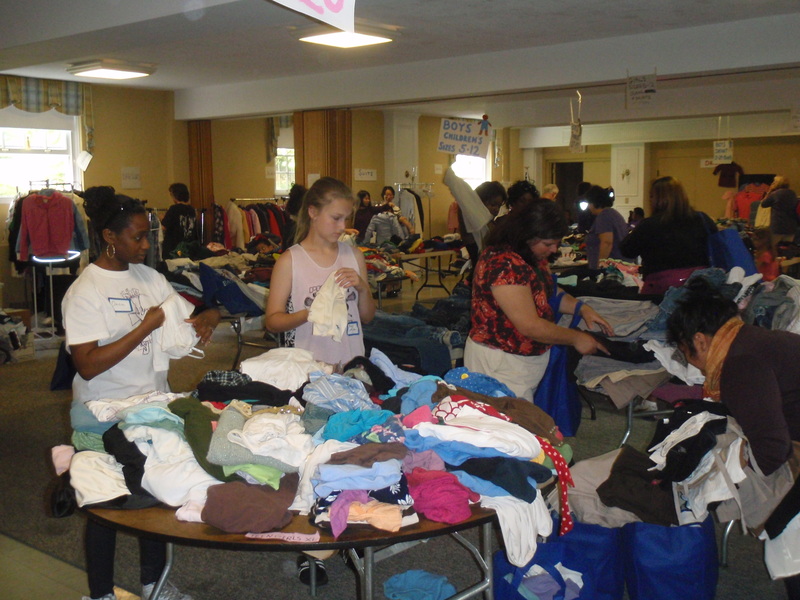 Paoli Hardware – for donating the large trash bags we use for the event clean up. Valley Forge Running Company – for donating shoes for the event. 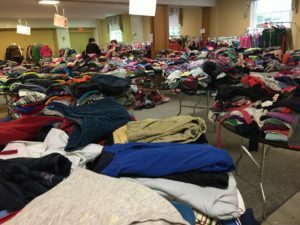 Wayne Sporting Goods – for donating clothing for the event. All the TESD Schools and the Easttown and Tredyffrin Libraries for agreeing to host public collection locations again this year. Conestoga High School – for laminating some of the table signs needed for the event. 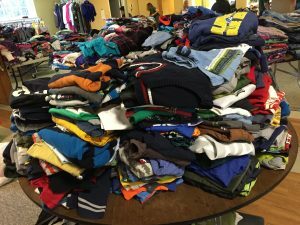 Big Brothers and Big Sisters – for picking up any left over donations. 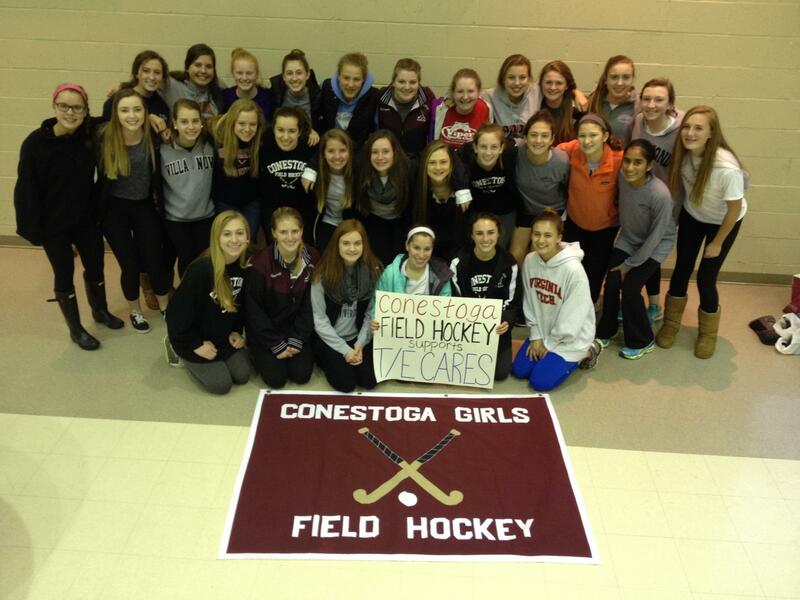 The CHS Girls Lacrosse and Field Hockey teams – for helping to sort all the donations dropped off at the libraries. 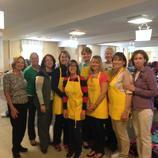 Panera Bread (Gateway) – for donating food for the volunteers to keep them nourished and full of energy on sorting day. 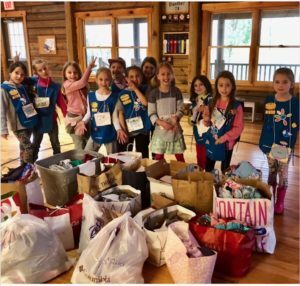 Hillside Elementary Daisy Scout Troop members – for sorting bags and bags of clothes. The AMAZING school reps and clothing sorters: Claudette McCarron and Nadia Gerard (BES), Christina Arnault (DES), Aimee Quinn (NEES), Kirsten McFarland (HES), Amanda Ivory (VFES), Bernie Logan, Lisa Buraks, Danyll Lockett, and Amanda Ivory (VFMS), Melissa Acton and Jodi DeFillipo (TEMS), Tori Hall and Jackie McGuckin (CHS). 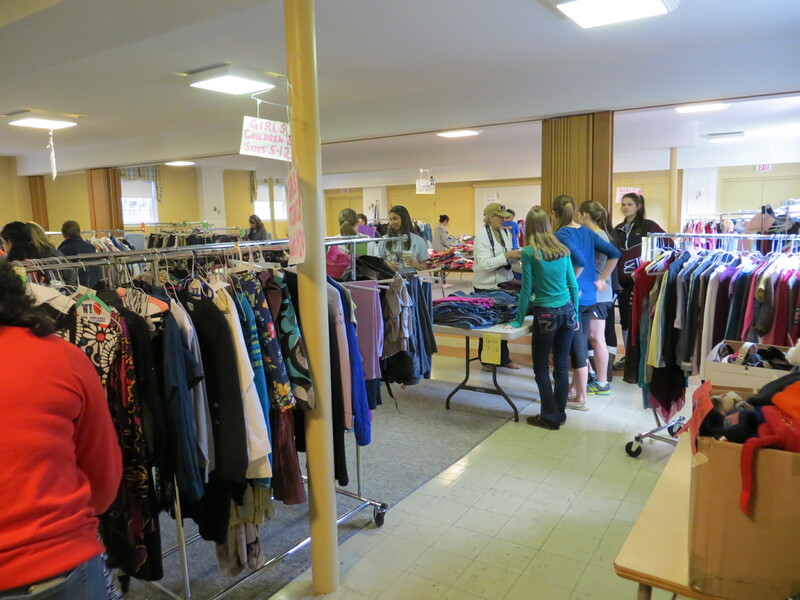 And EXTRA special thanks to the CHS students who coordinated this year’s Teen Pop-Up Shop. 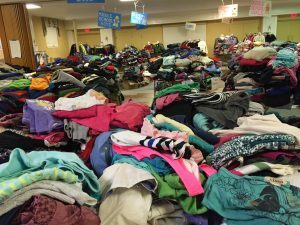 This is no easy task when they are trying to gather donations, set up the room, get volunteers, and go to school – all at the same time. A huge thanks to Pemmy Friedman and Fiona Kurtz. 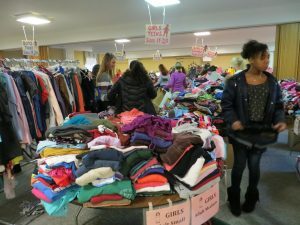 They and their core of helpers are key to the success of this special shopping experience. 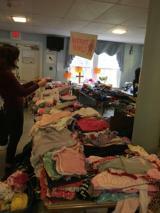 Once again the community donations were AMAZING for this event. Over 680 bags filled with clothes were donated from families all over the community and almost 500 of them were filled and distributed at the event. 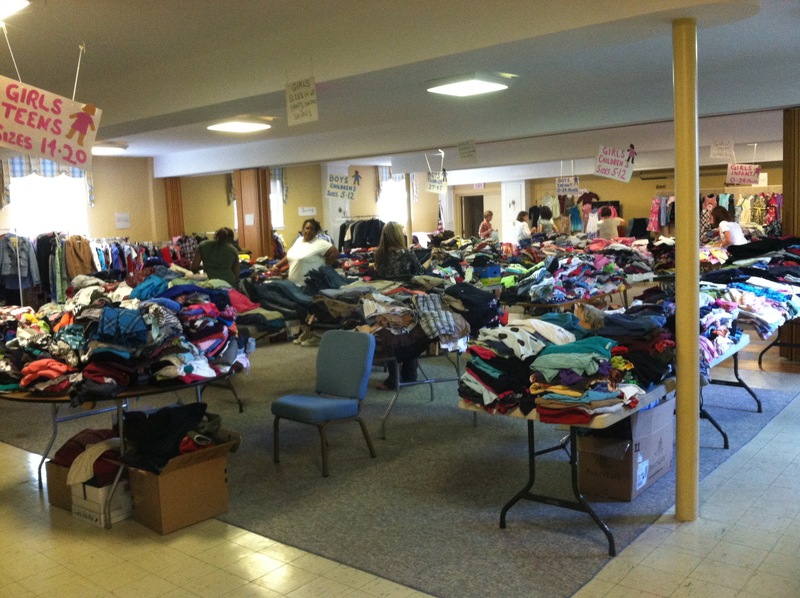 That’s a LOT of families that received lots of “new” items. Shoes, coats, prom dresses, shirts, hats, pants and more. 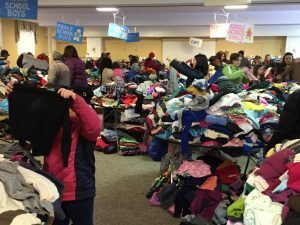 Over $6,400 was brought in as the result of this event, but more importantly we are happy to know that so many folks who needed clothes for their kids were able to find some. All left over clothing goes to Cradles to Crayons another great non-profit that helps families in the greater Philadelphia area. Nothing is wasted! There are lots of people, groups and businesses to thank. Be sure to check out the pictures as well. 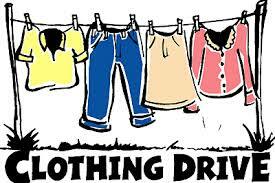 Questions can be sent to clothes@tecare.org. 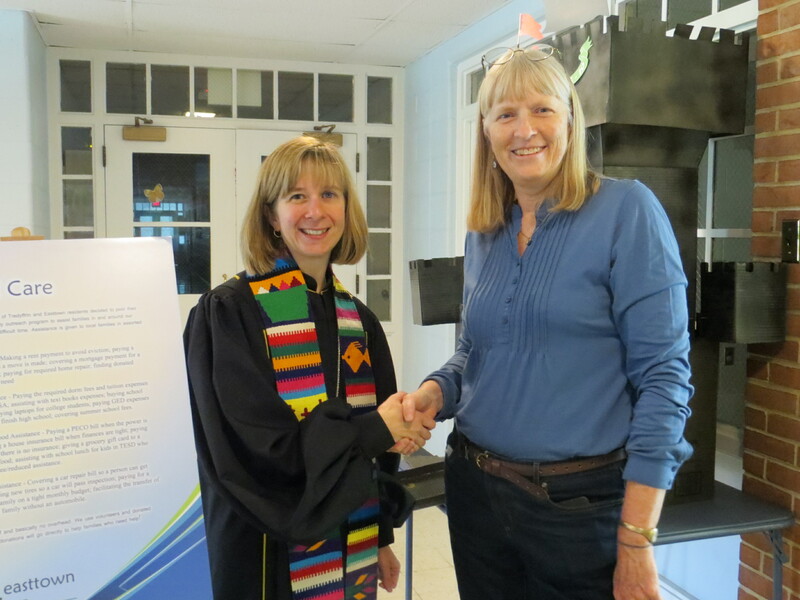 The biggest thanks of all – to St. Matthews United Methodist Church for 6 straight years, the most amazing host partner EVER! 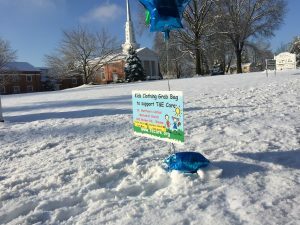 Easttown and Tredyffrin Libraries for agreeing to host two of our public drop off sites. All the TESD schools for being the main drop-off sites for all school families. Abby Schwartz Associates for printing our flyers. Paoli Hardware for donating the large trash bags needed for clean-up. American Solutions for Business for printing our street signs at a reduced price. 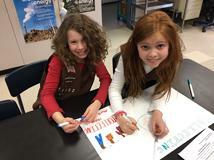 Girl Scout Troop #41552 for making posters to hang at VFES advertising the event. 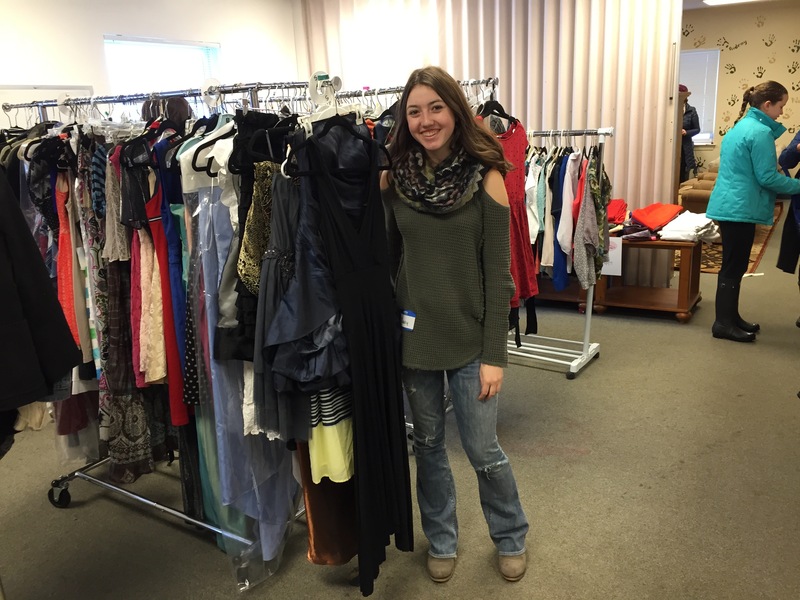 Bryce Mostoller, local student, for running a clothing drive in her neighborhood to collect needed items. 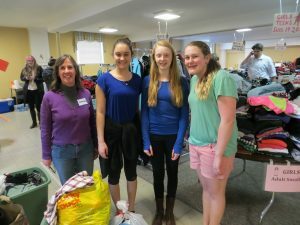 The CHS girls field hockey team for sorting all the donations dropped off at the Tredyffrin Library. Almost 100 large white trash bags full, these girls were VERY busy. The CHS girls lacrosse team for sorting all the donations dropped off at the Easttown Library. Another 100 or so large white trash bags full, these girls were also VERY busy. 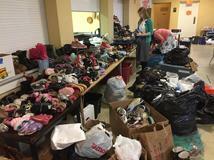 Berwyn United Methodist Church for loaning us a big room for sorting all the Easttown Library donations. 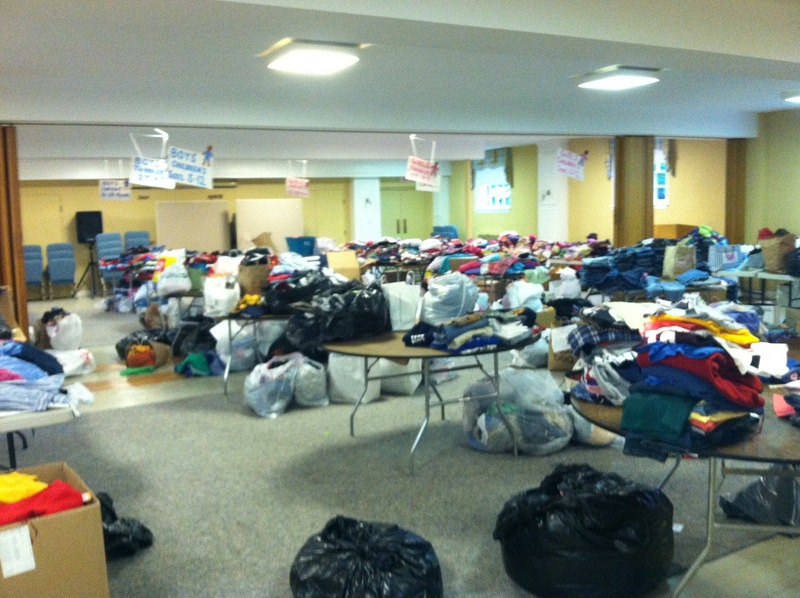 Evolve for loaning us space to sort all the Tredyffrin Library donations (and to Jean Allen for setting this all up). 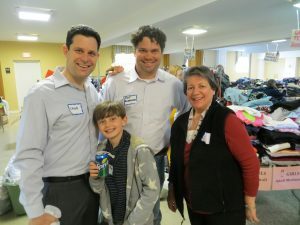 Declan Arnott for sharing his spring break time to help with the clothing drive. His muscles were much appreciated and for helping coordinate collections at Woodlyne School. He deserves a big pat on the back. The local boys rugby teams for cleaning up on Saturday. We were done in record time thanks to their amazing help. We had players from U13, U15 and CHS boys. Wegmans (King of Prussia), Trader Joes (Gateway), and Jimmy Johns (King of Prussia) for donating food for the volunteers to enjoy during the long hours of sorting. 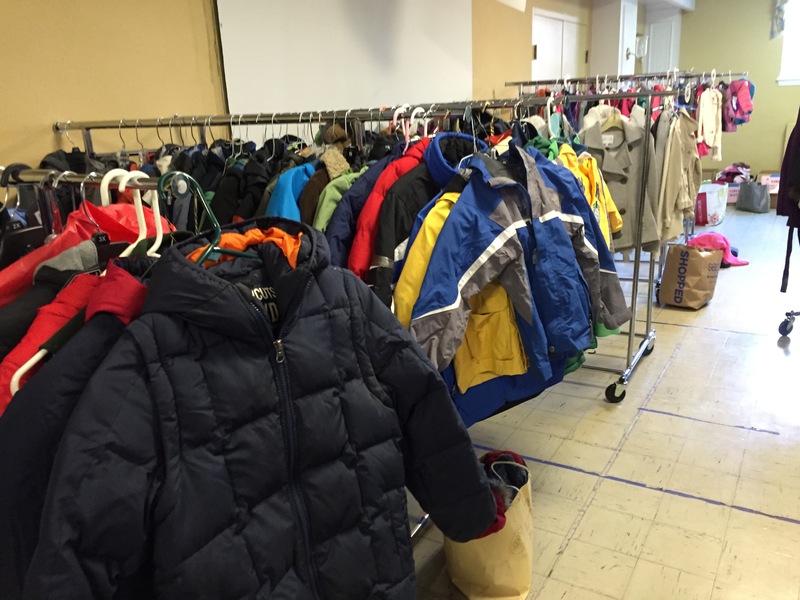 The Saturday Club and to TEMPO for loaning us their clothing racks again this year; they are VERY helpful to have! 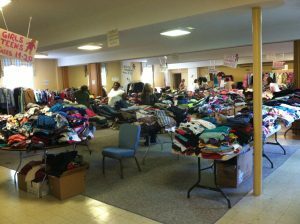 Wayne Sporting Goods (Wayne) for donating some new clothing items to the sale. 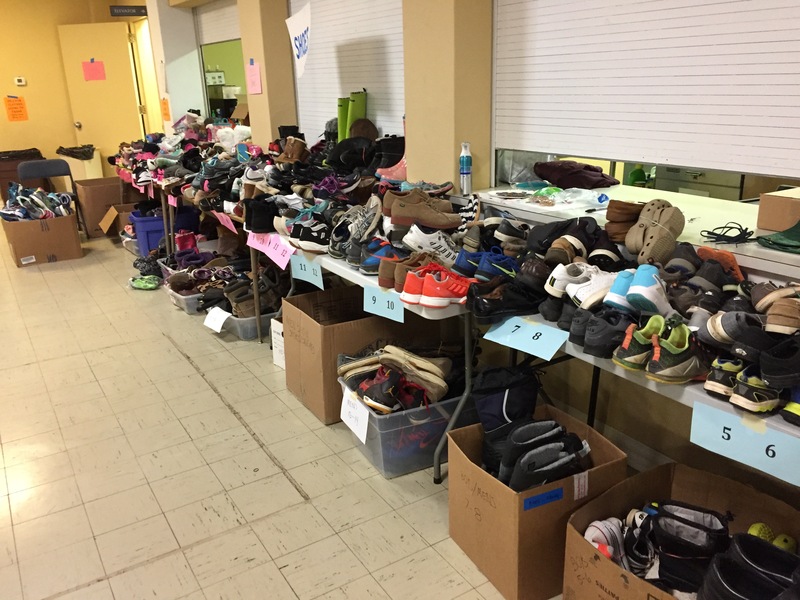 Valley Forge Running Company (Berwyn) for donating new shoes to the sale. 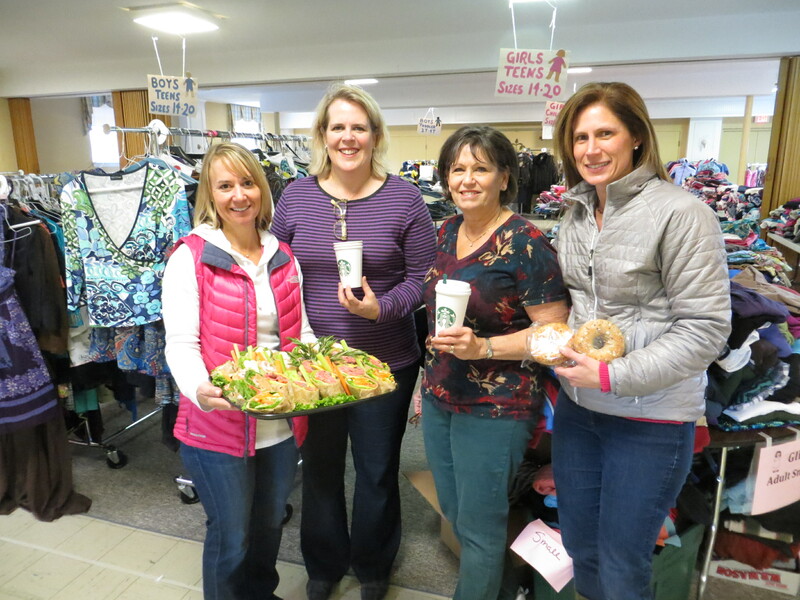 Marilyn Slotter, Kelly Campbell, Camille Bell, and Robin Sheard, amazing church members, for serving wonderful treats to the shoppers. 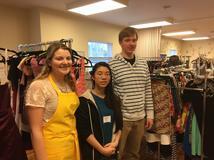 Matthew Nirmaier and Sara Gieske for being important assistants to Grace in the Teen Girls Pop-up Shop. The local private collection sites included: Wallace and Nilan Physical Therapy (Malvern), Wayne United Methodist Church (Lane Montessori), Trinity Preschool, The Malvern School, Berwyn United Methodist Church, Mom’s Club, The Church of Latter-day Saints (Broomall), Tarleton, Johnson Matthey, Montessori’s Children’s House, and Charleston, Kelly & Associates. 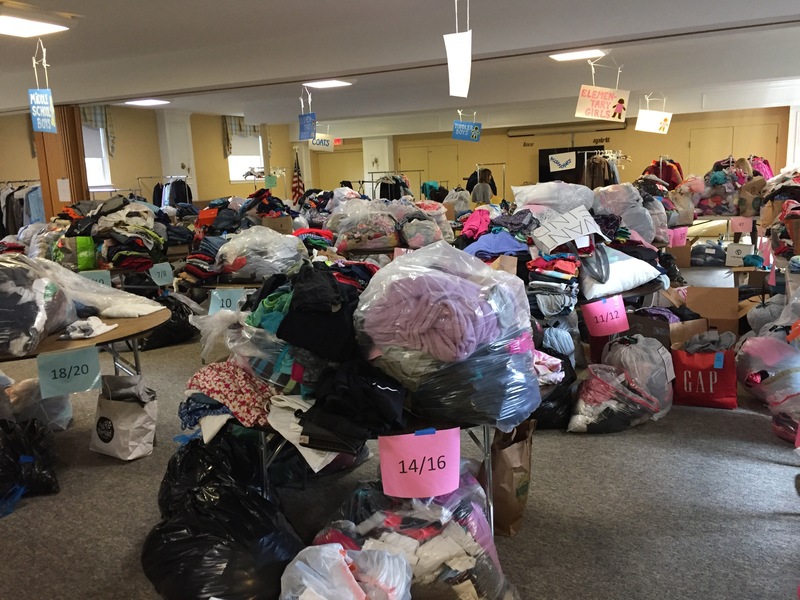 Special thanks to EVERYONE who donated clothes, encouraged others to donate clothes, sorted clothes, or helped in any other way. 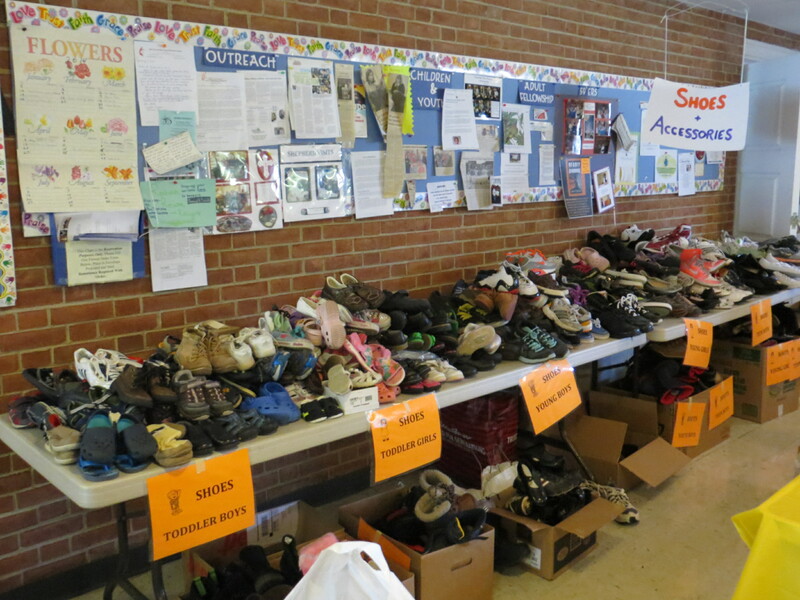 We appreciate everyone who made this such a success! 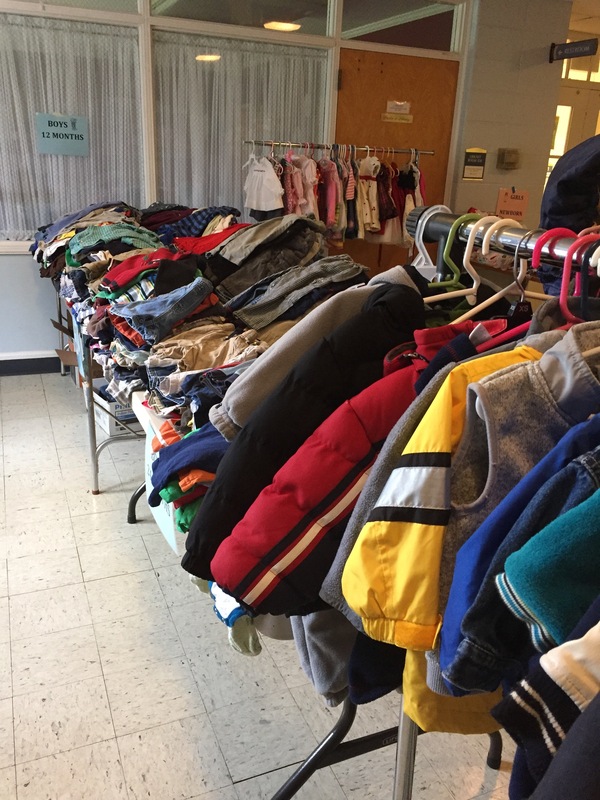 A huge shout out to the school reps for coordinated the sorting for all the donations at the schools: Claudette McCarron (BES), Amanda Wollick (DES), Kirsten McFarland (HES), Sharon Hardy (NEES), Amanda Ivory (VFES), Bernie Logan and Lisa Buraks (VFMS), Melissa Acton, Jodi DePhillipo, Jennifer Faris (TEMS), and Tori Hall (CHS). They were busy folks, to say the least. 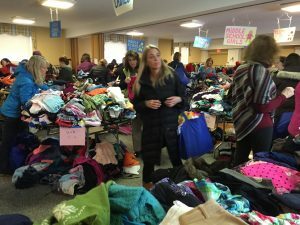 2016 GRAB BAG A HUGE SUCCESS!! 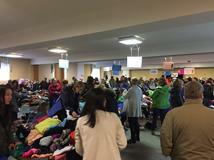 Thanks to all those individuals, businesses, organizations, schools, or groups who supported our 5th annual Grab Bag! The list of folks who supported us is way to long to include everyone – but please know that if you aren’t listed here – we still appreciate everything you did!!! 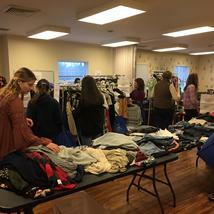 Of top importance is a huge thanks again to St. Matthews Methodist Church for allowing us to use their space for this event. 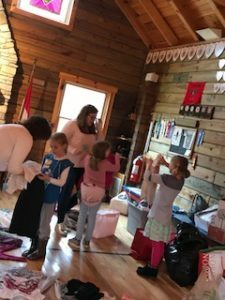 We literally take over the church for 4 days – the huge meeting room is our main drive, we grew enough that we added the entrance lobby area a few years ago, and the last 2 years we added the teen meeting room for the Pop-Up Shop. It’s truly the perfect site and location. 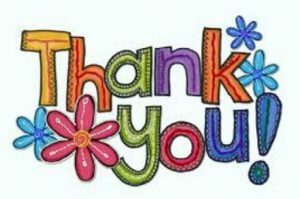 Thank you – thank you – thank you!!! 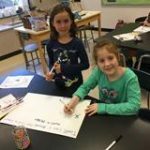 Abby Schwartz Associates – for printing our posters! The Easttown and the Tredyffrin Libraries, and all the TESD schools – for being collection hosts extraordinaire! Evolve – for allowing the field hockey team to do the sorting there – it took a huge space! Thanks to the amazing committee who organized the Grab Bag! 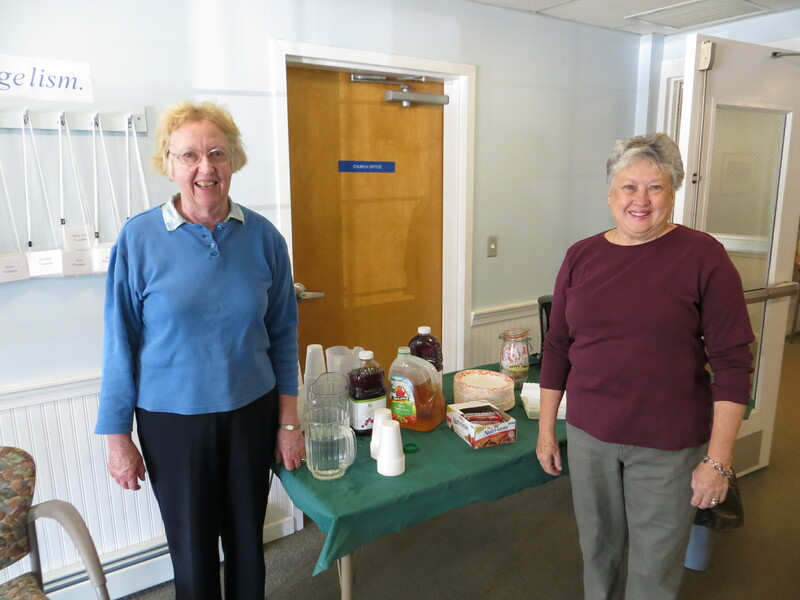 Marilyn Slotter and Gail Stohler – 2 really nice church ladies who set up a table for juice and cookies for the kids of any shoppers. 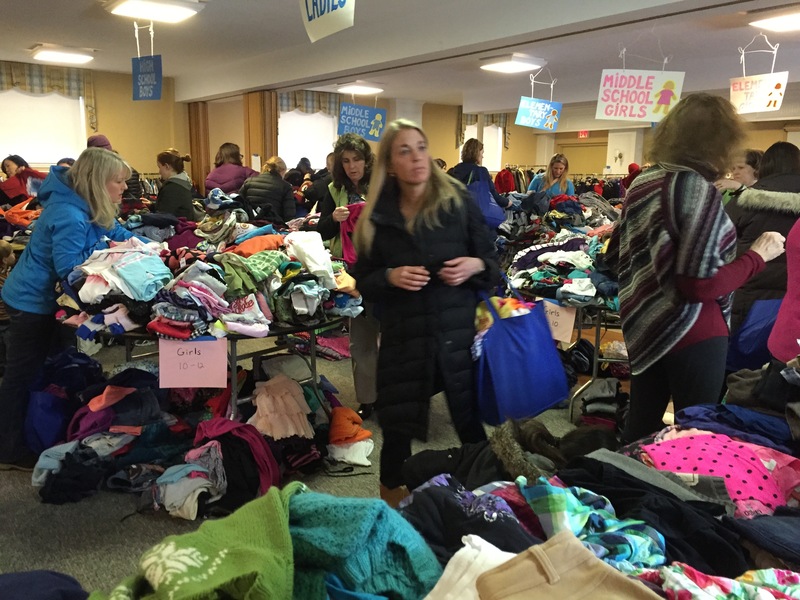 2015 KIDS’ CLOTHING GRAB BAG – Another HUGE success! 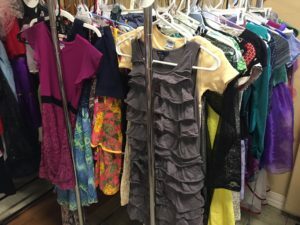 In case you wondered what happens to any left-over clothes that we didn’t “sell” – we work with Cradles to Crayons and give the clothes to them. 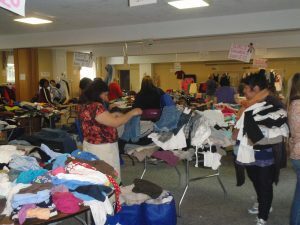 They have been VERY appreciative of the good quality clothes that are our “left overs”! Rest assured that they definitely go to another good cause! 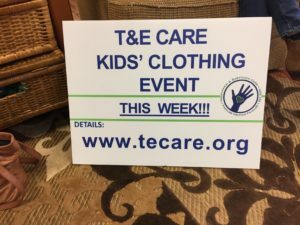 Anyone with questions should contact us at clothes@tecare.org. 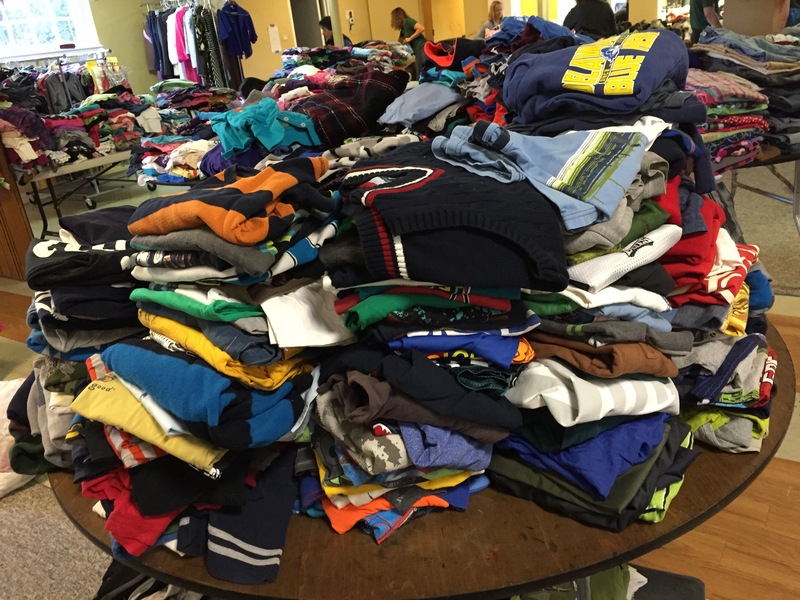 We REALLY appreciate the support of….. 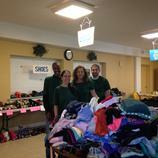 Whole Foods Devon – for providing sandwiches on the 2 set-up days – our volunteers are thrilled! 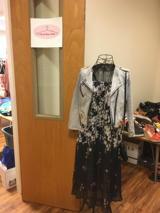 The Saturday Club and TEMPO for loaning us their clothing racks! 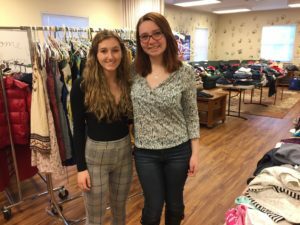 We REALLY need them to help display the clothes! Brian Pierce for creating the fantastic posters that (hopefully) everyone saw around town prior to the event! All the TESD schools – we couldn’t have run the event without your support! 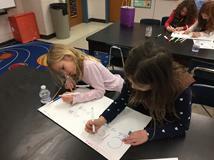 Thanks to the building principals and the school chairs: Amanda Ivory (VFES), Jamie Mushlin (BES), Barbara Schiff and Kim Brightman (DES), Lisa Buraks (NEES), Pam Emel and Bernie Logan (HES), Karen Ridder and Rita Gosnear (VFMS), Melissa Acton, Ger O’Leary, and Jen Faris (TEMS), Tori Hall (CHS). Thanks to the other public collection hosts and sorters. 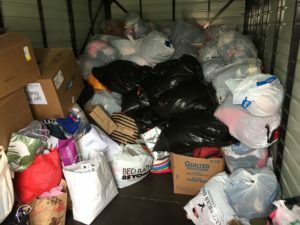 These sites are so wonderful to allow all these donations taking up space for over a week! 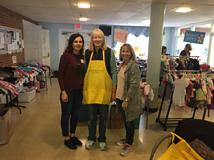 Marci Romberger at Play It Again Sports (Berwyn), Robin Stuntebeck at Doctors Best Immediate Care (Berwyn), Pam Emel at Club La Maison (Wayne) and Lisa Murphy at the Tredyffrin Library (Wayne). 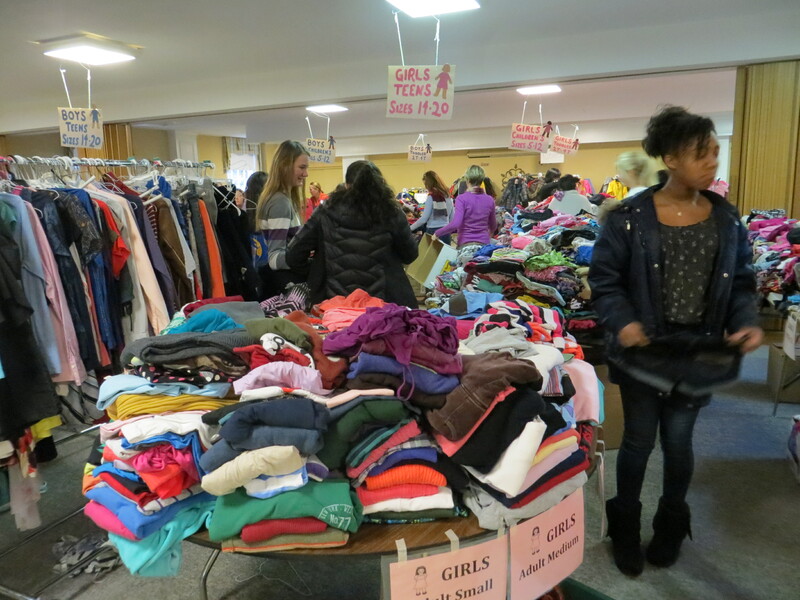 The CHS Field Hockey Team, lead by Jean Allen – this group of girls sorted over SEVEN carloads of clothing for us. And these cars were packed FULL! It was an amazing gesture of support! 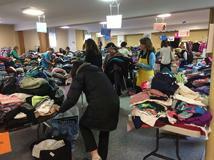 There were many private groups also doing collections! 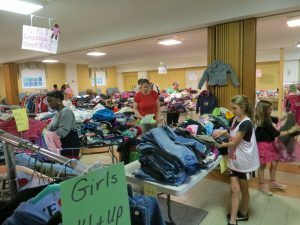 We are extremely thankful for the help of these sites and their sorters: Paoli Hospital (Brad Zerr/Lisa Nevins), Montessori Children’s House and Wayne United Methodist Church (Story Picard), Trinity Preschool (Suzi Alrutz), Berwyn United Methodist Preschool (Maura Harley), Mom’s Club (Laura Mills), Plato’s Closet (Nancy Bevan), LDS Church (Tammy Small), Tarleton (Hadley Witcher and Caroline Sturm), Vertex (Laura Bruce), Johnson Matthey (Donna Johnson), Famous Footwear (Lisa Davis) and the Law Office of Lisa Charleston (Lisa Charleston). 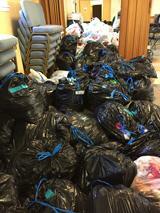 Special thanks also to any groups who held a collection and we missed naming you! 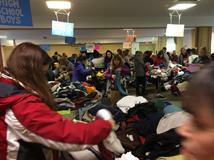 And thanks again to EVERYONE who cleaned out a closet or a dresser in order to support the event! The results again were staggering! 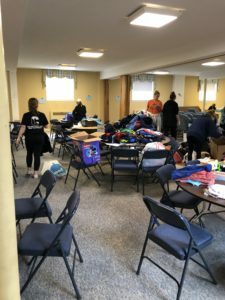 There were MANY MANY volunteers who came to sorting day or worked at the event or hung/collected signs or picked up the special food treats, or ……(more and more). We can’t name them all – but will give a shout out to the Main Line Rotary for sending volunteers and to many district students, particularly from the CHS Key Club. 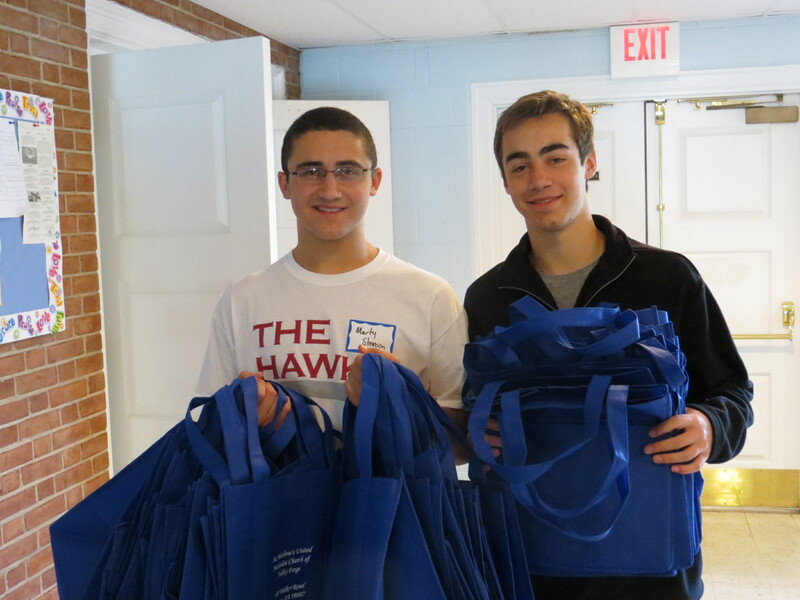 The students were HUGE helps – especially when it came to all the heavy lifting needs! THANKS THANKS THANKS TO ALL!!!! 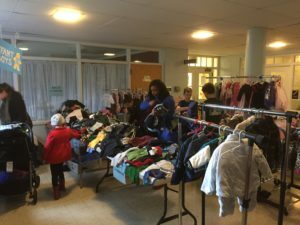 The Grab Bag is over and we are happy to report that LOTS of folks were able to get some great great clothing for their kids as the result of the wonderful clothing donations made by so many local families. We know from our total revenue (over $3400, up from $2500 last year) that we had some nice cash donations in the mix. 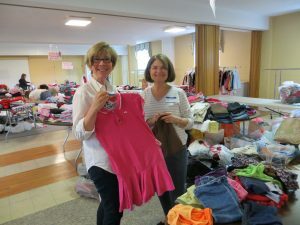 But we also know that there were families who had tears of thanks at the thought that they didn’t have to pay for the big bags of clothing that they took from the event. This year’s event will took place on March 28 and 29. Any questions can be sent to clothes@tecare.org. MANY MANY MANY thanks to so many folks who helped with this event. 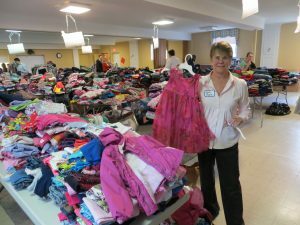 The biggest shout out is to St. Matthew’s United Methodist Church of Valley Forge, and Pastor Dawn Taylor-Storm, who so willingly allowed us to again come in and take over the church! What a busy place that was. Besides our totally filling the main lobby and large congregation room in the lower level, there were choir practices happening, scout troops meeting, tours being given, preschool classes being held, and of course, church business going on! We never heard one complaint that we were “in the way” – even though we knew we were! And special thanks to the church “ladies” who offered cookies and treats to the shoppers on Friday! What a nice touch that was! Special thanks also to the amazing chairs of this event: Lisa Davis, Carol Tompkins, Jeanette Alwine, Jennifer Arnott, and Pam Emel. They did a terrific job organizing the volunteers, coordinating all the collection sites, designing the layout for the church, coordinating details with the church, and overseeing the whole event. 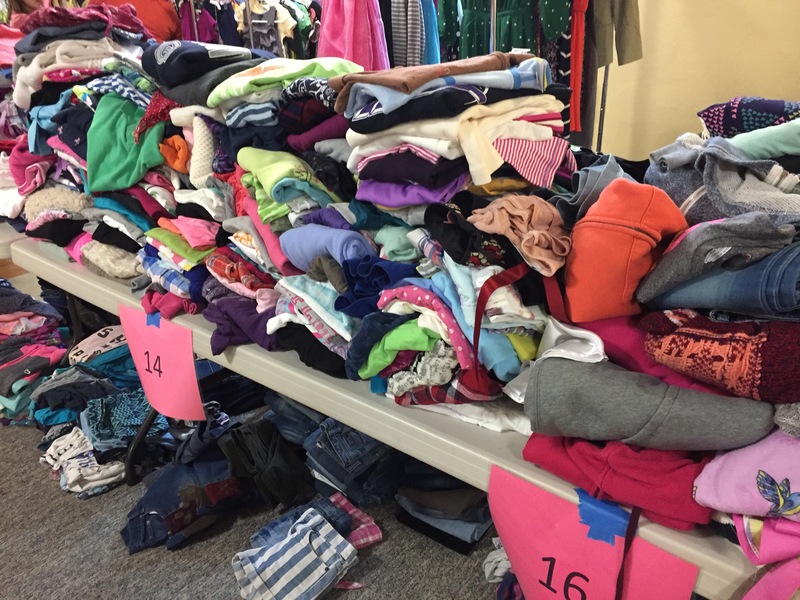 They may not want to see a pair of jeans for a while now that it’s over, but their efforts were amazing! Between the collection locations and sorters, the school reps that did PR for us, the folks who hung posters around town, the volunteers who took the left overs to Cradles 2 Crayons, and all the volunteers who helped out one of the 4 days of the events – we had well over 220 different volunteers!!! It was truly a community effort. 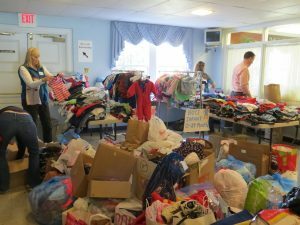 The list below gives the main businesses and groups that helped out in one way or the other. Please say thanks! All eight of the TESD schools – for being public collection locations. 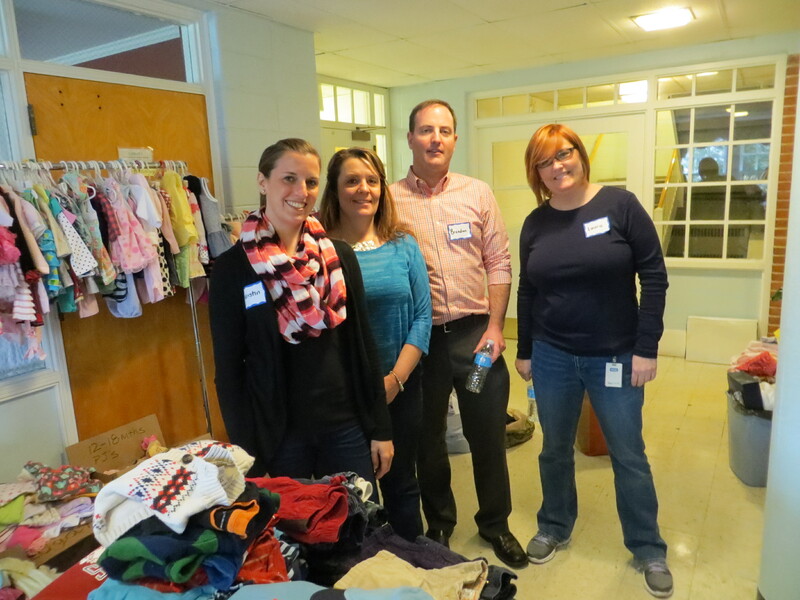 We definitely could NOT have held this event without their help! And special thanks to the volunteers who coordinated those sites: Rachel Dunleavy, Jen Hofmann and Jamie Mushlin (BES), Lori Piccone and Kim Brightman (DES), Kristina Haines (NEES), Pam Emel (HES), Jennifer Arnott and Amanda Ivory (VFES), Karen Ridder, Bernie Logan and Rita Gosner (VFMS), Melissa Acton, Sue Butler, Geraldine O’Leary and Gina DeFlavia (TEMS), and Emer Ryle and Tori Hall (CHS). AMAZING folks! Doctor’s Best Immediate Care (Berwyn) and Play It Again Sports (Berwyn) – for being a public collection locations – the last THREE years! 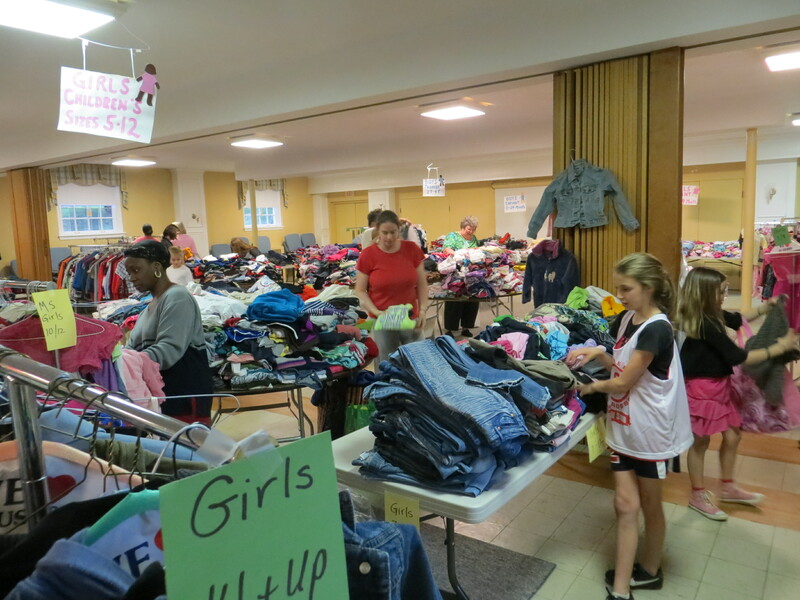 And special thanks to the CHS Girls Field Hockey Team and Leanne Rush for doing the sorting for both sites! Club La Maison (Wayne) – for joining our list of public collection locations this year! 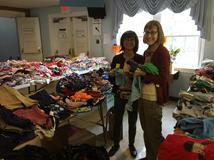 Thanks to Nancy Bevan and Pam Emel for helping to sort donations at this site. Paoli Hospital – for hosting a private collection for us – again for the last THREE years! Special thanks to Brad Zerr and Lisa Nevins for helping with this site! 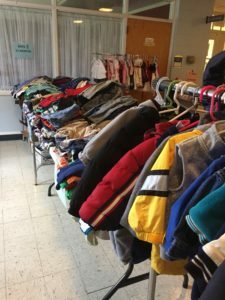 Vertex, Berwyn United Methodist Church, LDS Church, Mom’s Club, Montesori Children’s House, Plato’s Closet, Tarleton Nursery School, The Malvern School, Trinity Preschool, and Wayne United Methodist Preschool (Lane Montessori) for hosting private collection locations for us! Having all these extra sites REALLY helped! Paoli Hardware Store – for two large boxes of trash bags, used to transport the clothing. Whole Foods (Devon) – for agreeing to offer YUMMY sandwiches and bagels to the volunteers on sorting day and on sale days. 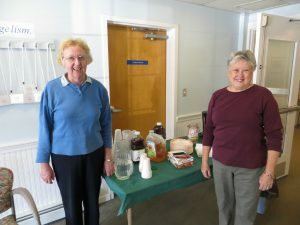 Starbucks (Wayne) – for offering delicious bagels and coffee for the volunteers working at the event. Brian Pierce – for designing the great posters that help us get word out about the event. 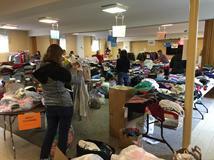 Brinker Capital (Berwyn) – for sending a number of volunteers to help us sort and run the event, as well as collecting clothes! 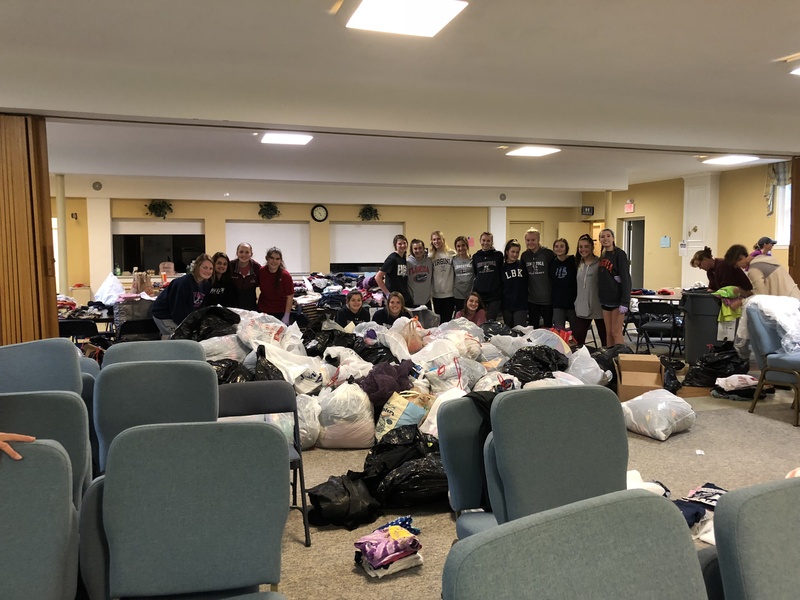 CHS field hockey team, NHS and Key Club members, T&E Kids Care Club members, and other students from CHS, Hillside ES, Valley Forge ES, Valley Forge MS, and T/E MS – for helping with the collecting and sorting before the event, and working at the event. 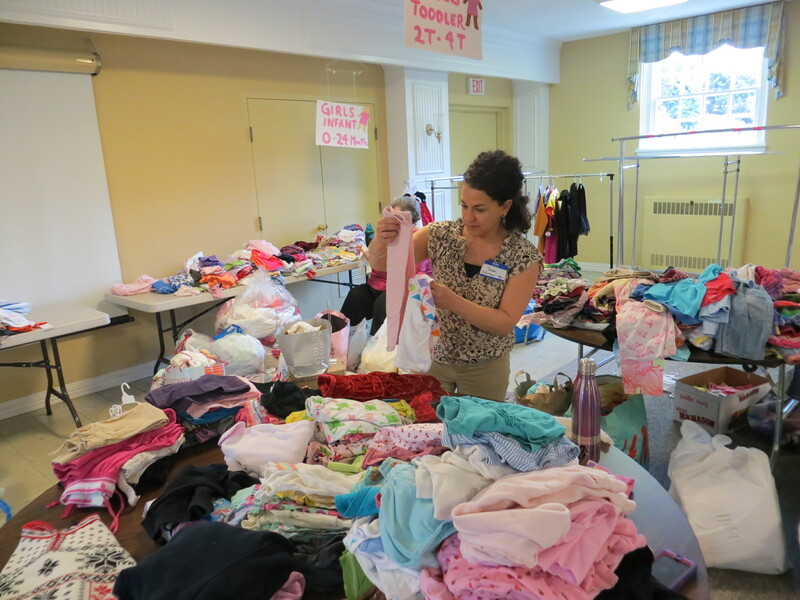 The 2nd annual spring 2013 Grab Bag was held April 12 and 13 at St. Matthew’s United Methodist Church of Valley Forge on Walker Rd. What a great success this was. We had so many wonderful donations of clothes, and at the other end we had LOTS of people “shopping” and getting great clothing at no or low cost. 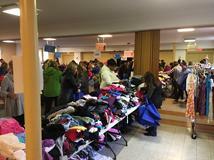 Thanks to ALL those involved in making the 2013 Grab Bag such a big success…..
Jeanette Alwine, Lynn Greco, Laura Pratt, and Jennifer Arnott – the fabulous co-chairs of the event!! We can’t say thanks enough for all their efforts! The folks at St. Matthew’s United Methodist Church of Valley Forge and Pastor Dawn Taylor-Storm – what a fantastic partnership! 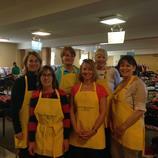 Even the ladies of the church made cookies and offered goodies for the shoppers and volunteers! Oh my! 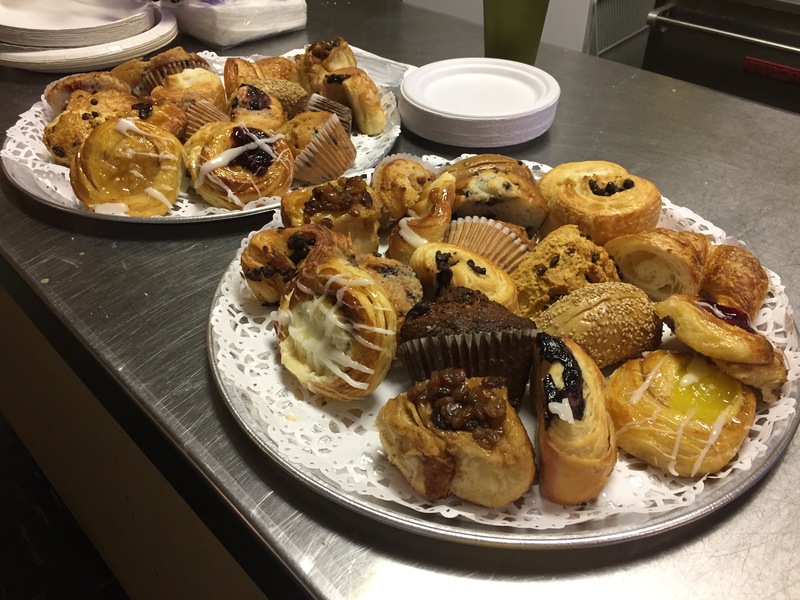 Panera (Gateway), Starbucks (Wayne), and Pizza Land (Chesterbrook) for donating baked goods, drinks, and pizzas for all the volunteers during the sorting time – they were really delicious and kept us focused on our task! 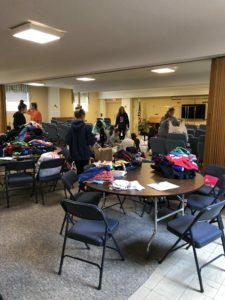 Giant Foods (Frazier) and Paoli Hardware (Paoli) for donating bags used in distributing the items as well as bagging up the extras. 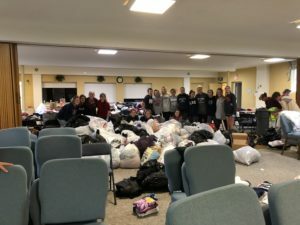 Various CHS groups for lending a hand, including members of the Key Club, National Honors Society, the Girls Softball Team, the Girls Field Hockey Team, and the T&E Kids Care Club. Doctor’s Best Immediate Medical Care (Berwyn), Play It Again Sports (Berwyn), and all the TESD schools for being official collection sites for the event. 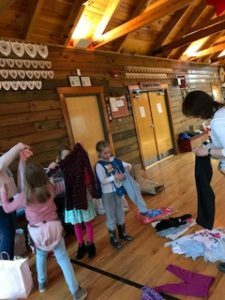 Having many bags of clothing in the lobbies and hallways can’t be easy! Paoli Hospital, Montessorti Children’s House at VF, Johnson Matthey (Devon), Central Baptist Church and Nursery School (Wayne), St. Luke Lutheran Church (Devon), the Baptist Church in the Great Valley (Devon), DeLage Landen Financial Services (Wayne), and the TESD Administration Offices were all private collection sites. 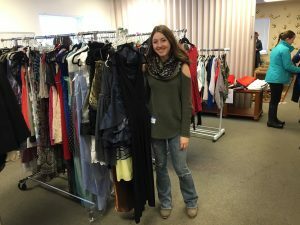 These extra clothes REALLY make a difference in our collections. Thanks to all sooooo much! TEMPO and The Saturday Club for loaning us their clothing racks – what a HUGE difference that made in laying out the space. 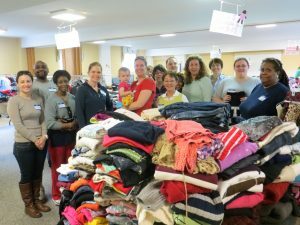 Thanks to Devereux for “loaning” us a few of their residents to help with the sorting of the clothes – they did a GREAT job! 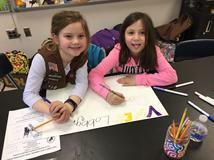 To brownie troops #41242 (3rd grade at BES) and #42062 (HES) for making posters for their schools, and to the 1st graders at HES (thanks Libby Pechin for organizing) for making even more signs for HES! 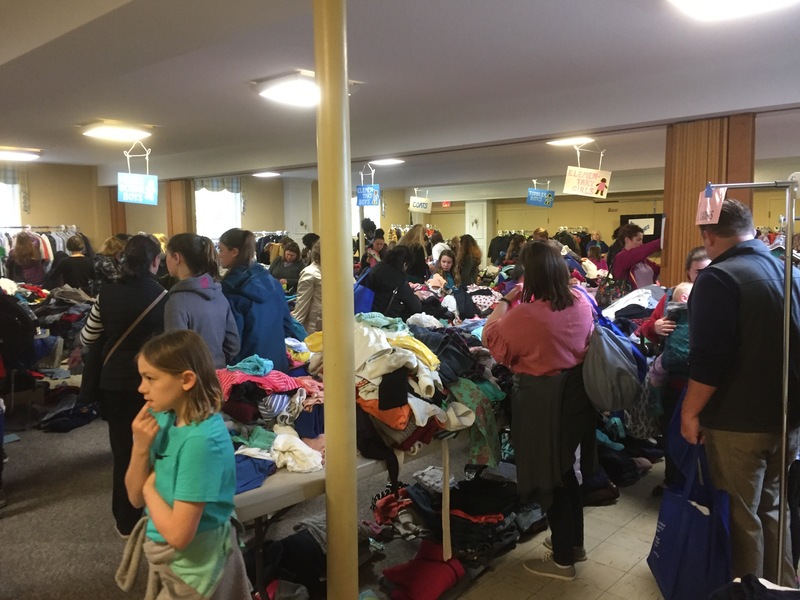 All those collection site chairs at each school and private site who had to sort through the many many bags of clothes delivered to each site, and get them to the church for further sorting! 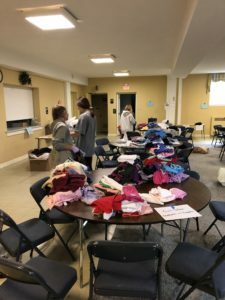 Rachel Dunleavy and Jen Hoffman (BES), Kim Brightman and Heather Hill and Beth Breault (DES), Jenn Fuscaldo and Tracy Sidoriak (NEES), Pam Emel and Jane Balsan (HES), Jen Arnott (VFES), Rita Gosnear and Bernie Logan and Karen Ridder (VFMS), Melissa Acton and Teri Santivasci (TEMS), Jackie McGuckin and Tori Hall and many students (CHS), Jenny Gragilla (Doctor’s Best), Marcie Romberger and the CHS field hockey team (Play It Again Sports), Brad Zerr and Lisa Nevins (Paoli Hospital), Story Picard (Montessori Children’s House and Central Nursery School), Donna Johnson (Johnson Matthey), JoAnne Hilly (TESD Administration Offices). 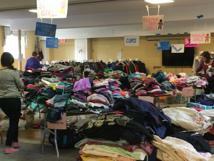 And of course – a HUGE thanks to all who donated clothing and volunteered to sort clothing at the event. A true team effort! 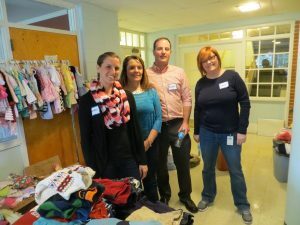 First Annual T&E Care Grab Bag – a big success! 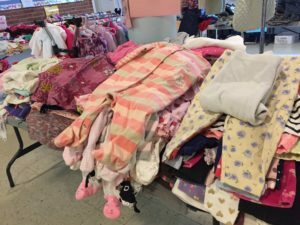 I just wanted to let you know that the Kids Clothing Grab Bag was wonderful. I was able to get some nice things for my daughter. I also wanted to tell you that I went to another clothing exchange on Saturday before I came to this one and it was no where near the quality of TECares. 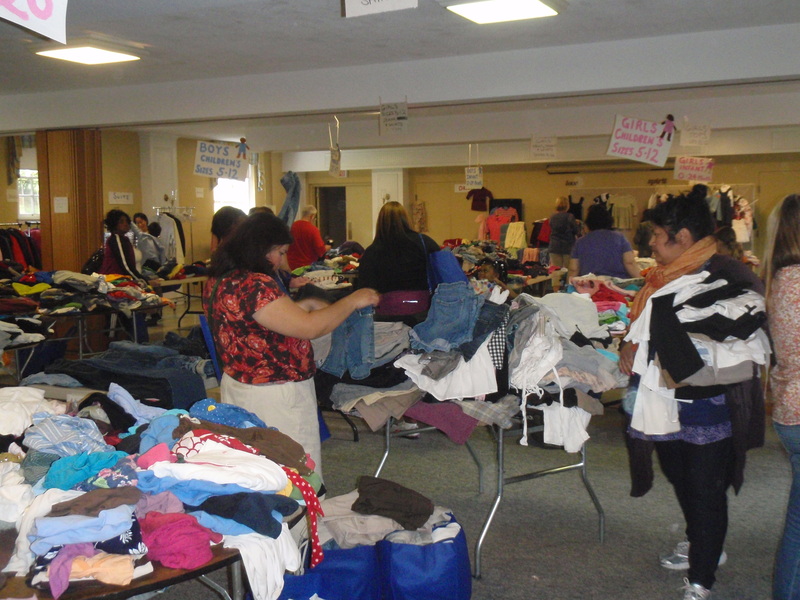 Everyone at TECares was very helpful, the clothes were organized by sizes and in neatly folded piles and the clothes were in very good condition. I was very happy that I made it to the event and wanted to say thank to all that help put this event together. I am very happy to be apart of a community that cares and does so much for everyone. 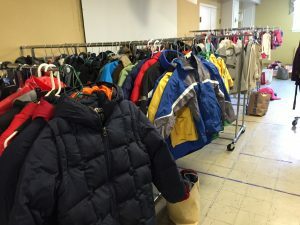 I hope with this being the 1st Kids Clothing Grab Bag that it continues in the future years. Great Job and Thank you to everyone. 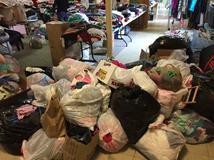 I wanted to thank you so much for holding your Kid’s Clothing Grab Bag this past Saturday. 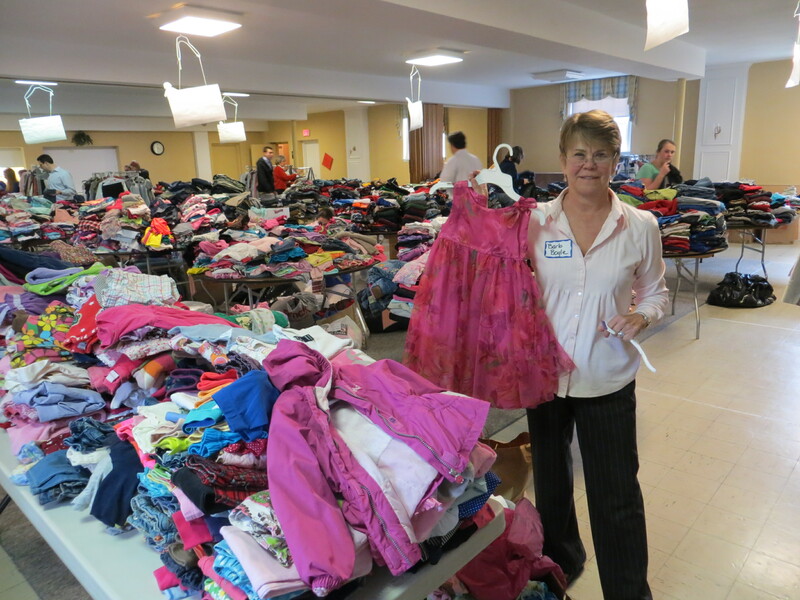 We are on a tight budget and I was able to find wonderful clothes for all my children at your event. 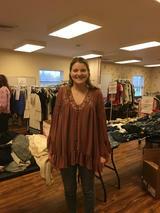 I went with my sister and friend who were both able to get great finds for their kids as well. Thanks again and looking forward to hopefully another Grab Bag next spring! 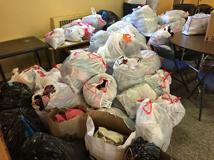 Thank you so much for all of the clothes my family received from the clothing drive. It was a tremendous help to us. I am so grateful for all that you and TE cares does for the community. 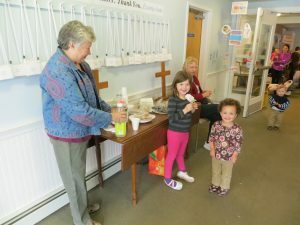 Many thanks again to St. Matthew’s Methodist Church for hosting the event, and also for surprising us with a welcome table of coffee, juice, and muffins for volunteers and shoppers. What a wonderful gesture! They truly bent over backwards for us – we couldn’t have asked for a better location. Special recognition again to our drop-off locations: All the TESD schools, Doctor’s Best (Berwyn), Penn Liberty Bank (Wayne), Play It Again Sports (Berwyn), Center on Central (Paoli), Wayne Presbyterian Church, Paoli Hospital, Johnson Matthey, Plato’s Closet, St. Luke Church, St. John’s Presbyterian Church, The Baptist Church of the Great Valley, and of course St. Matthew’s Church. 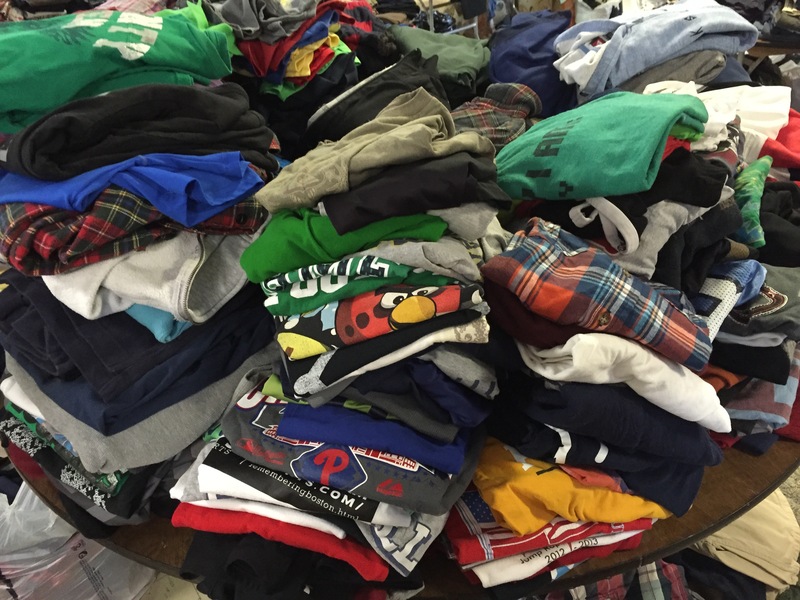 To all those who cleaned out their closets – you did a GREAT job finding us wonderful clothing. MANY THANKS! We also appreciated donations of the plastic bags from Wegmans, Acme, Paoli Hardware, Giant, and Walmart, and some of the coat hangers from Organic Clean Natural Cleaners (Devon). Again we appreciate all those who helped volunteer during the collections or set up, at the event itself, by creating and/or hanging posters, and dropping off the left-overs at other charities. We especially appreciate the help by so many of the families that we have supported in the past – many volunteered for this event – it was a great way for them to give back! A really tremendous job done by all. Special thanks also to our chairs: Jeanette Alwine, Lynn Greco, Laura Pratt, and Karin Maynard. It’s always risky to tackle a new project, but they thought it through well and figured out all the possible glitches.